"A healthy community is one that encapsulates both the health of people and place, where people can be physically healthy and live in a neighbourhood that is thriving socially, environmentally and economically." Farmers in sustainably producing food and fibre to feed and clothe a hungry nation with a focus on the farming industry your school is investigating. The role of consumers in sustainably consuming food and fibre. The commitment of Australian farmers to feed and clothe us whilst protecting or enhancing biodiversity and providing "ecosystem services". Those services are creating clean air, clean water, shelter for food and fibre production and native animals and cultural value. The impact of food and fashion waste on the planet and how farmers and the community can work together to minimise it. Renewable energy and its role in sustainable production and consumption. Health and Nutrition. Everyone in Australia deserves access to safe, affordable and nutritious food. In return, everyone in Australia should value their food and the role that physical exercise plays in maintaining a healthy body, mind and lifestyle. The challenge of the 21st century is clear: to feed the world’s growing population while safeguarding our natural resources in the process. We have a long way to go considering one billion people are undernourished today. With more people to feed and house there is growing competition for land and water and energy between housing land, farming land and mining land Our land, our water and our non-renewable energy are precious resources and we all should use them wisely. Right now, it takes less than a second to add two people to the world population. In the same second, farmland available to feed our growing population is shrinking by an area about the size of a soccer field. We must produce more food from less land to feed our growing population. Past farming practices have left the soil vulnerable to be swept away by wind and rain. Already, an area large enough to feed Europe has been so severely degraded, it cannot produce food. Better farming practices can halt and even reverse the process of soil degradation. At the same time, farmers are now using existing farmland more efficiently. It is pivotal that governments monitor what is happening to their land and incorporate soil protection measures involving agriculture, forestry, water management, industry and waste disposal sectors. By 2050, our global population is expected to reach 9 billion people and the demand for food will grow by 70%. Even if we convert all remaining land to cropland, we will get nowhere near meeting the future demand for food without increasing agricultural productivity and efficiency. Success requires farmers having access to a range of agricultural solutions, education to gain necessary skills, and financial incentives. Sustainable farming solutions include not tilling the land, crop rotations, bringing vegetation back to degraded land and planting vegetation around fields to prevent erosion and transitioning to green energy technology. Resourceful land use also contributes to mitigating climate change. Globally 2 to 3 billion metric tons of carbon can be stored per year in soil. Farmers can produce higher yields on existing farmland, prevent further loss of fertile land, and find innovative ways to make use of marginal land, especially in developing countries. Success in agriculture hinges on many factors, but farmers worldwide have perhaps one common fear: lack of water. And for good reason. According to the Food and Agriculture Organization (FAO), agriculture uses about 70 percent of the world’s fresh water and shortage will have a huge impact on food security. It is imperative that we all make water efficiency a priority if we are to manage water scarcity. Farmers need incentives to implement better water management. They need infrastructure and financial support to explore innovative solutions that produce crops with greater water efficiency. Worldwide up to 40% of the water used by some farmers is lost due to inefficient practices such as field flooding. A recent study by the 2030 Water Resources Group found that existing agricultural technology can sustainably increase water use efficiency, at reasonable cost and with little investment. For example, improving soil structure can conserve water. Weed control using herbicides lowers the need for tillage, leaves roots in the soil and improves water absorption. Efficient irrigation systems deliver water to roots and planting grasses around paddocks helps keep water in the soil. In combination, these practices dramatically reduce surface evaporation and water run-off. Stopping run-off can also ensure agricultural chemicals and soil from paddocks don’t reach rivers and streams. In addition, we need to broaden our focus to include land productivity and water productivity. We have to get the more crop per drop. Use of drought resistant and water and fertiliser efficient crops and pastures can help produce reliable yields even when water is scarce. There is no one solution to deal with water scarcity. Investment is needed to develop innovative water-efficient technologies, drought-tolerant seeds, crop protection products and optimized irrigation systems. But the best solutions can only help when farmers can afford them and understand the advantage of using them. Thus, infrastructure for knowledge sharing and access to technology must be strengthened. Incentives such as access to affordable credit and financial risk-management mechanisms such as insurance for weather-related crop losses will also be critical. With appropriate settings and technologies, projected increases in water demand need not increase pressure on water limited catchments. Payments for carbon sequestration could be harnessed to reward rural land owners for restoring ecosystems, increasing native habitat by 17% and decreasing extinction risks by 10%, without large additional government outlays. Non-agricultural water use is projected to increase by 65 to 150% by 2050, while the value of national economic output increases by more than 150%. While water use is projected to double by 2050, this growth can be met while enhancing urban water security and avoiding increased environmental pressures through increased water recycling, desalination and integrated catchment management. Biodiversity can be defined as the functioning of all living things through providing "ecosystem services". Those services are creating clean air, clean water, shelter for food and fibre production and native animals and cultural value. Biodiversity exists in the soil, vegetation supported by the soil, wildlife that access soil, vegetation and habitat. Biodiversity is in the eye of the beholder. For some it is our life support system, for others it is a resource to be used, for others it is a precious cultural symbol. Australians have long had a sense that our biodiversity is special, but despite our sense of its importance, in many parts of our country biodiversity is in trouble. BIODIVERSITY IS THE VARIETY of all lifeforms on Earth – all the different plants, animals and microorganisms, and the ecosystems they live in. in the context of farming, biodiversity refers to the woodlands, native scrub, trees, shrubs and native grasses, as well as the insects and other animals that live on farms. Farmers strive to manage the environment in a way that not only allows this rich biodiversity to coexist with food and fibre production coexist, and also helps biodiversity thrive. More importantly, biologists understand that the trend can be reversed. Many ecosystems have been lost during the past 200 years. NRM is an important activity on 94% of Australian farms, resulting in improved productivity and sustainability. By applying three principles – retain, restore and revegetate – cattle and sheep farmers can protect and even enhance biodiversity on their farms. Australian farmers are planting more trees for environmental purposes than a decade ago. In 2001, farmers planted 20.6 million tree seedlings for NRM, compared with nine million in 1991. On average, each Australian farmer plants 150 tree seedlings a year, solely for conservation purposes. Many of Australia’s farmers are active members of Landcare groups, and have been since Landcare’s inception in 1989. Landcare was established by the National Farmers’ Federation and the Australian Conservation Foundation to provide a vision for transformation to ecological sustainability through collective community lead groups. Initiatives such as Landcare Week are opportunities to recognise the role Australian farmers play as environmental stewards and land managers. Renewable energy is energy which can be obtained from natural resources that can be constantly replenished. assist in the delivery of energy generated using renewable energy technologies to energy consumers. Driving investment in clean, genuinely renewable energy and committing to a timetable for replacing polluting coal-fired power stations. Committing to an ambitious program for reducing carbon emissions and improving energy efficiency. Ceasing fossil fuel subsidies and putting an end to unrestrained mining and gas expansion. Australia has the natural and institutional resources to prosper in almost all scenarios for global energy and resource use. Global demand for exports is projected to treble by 2050 as global per capita income also trebles. We should expect long term growth of world energy demand, but demand for specific materials and energy exports could vary. Even in scenarios with strong global action to reduce emissions, energy and other resources could remain one of the pillars of the Australian economy, as long as commercially viable technology solutions are developed in a timely fashion to manage environmental impacts. Domestically, energy affordability can improve, especially when we enhance the efficiency and productivity of the energy system. Transport affordability might also improve, especially through the large-scale adoption of electric vehicles. Energy is one of the fastest growing costs for farmers, with electricity and diesel accounting for a significant proportion of total farm costs. Energy use efficiency describes the total amount of energy used on farm (in the form of electricity, diesel, or other sources) compared to the amount of production. If energy consumed can be reduced, while production is maintained or increased, energy use efficiency is improved. This may be one of the fastest and easiest ways to improve profitability, and will also reduce greenhouse gas (GHG) emissions. Research indicates there are significant opportunities to reduce energy - and therefore costs on Australian farms. It is important for farmers to monitoring their energy use to estimate use and costs, and track these costs over time. An audit can also identify energy and cost savings, such as fuel switching and tariff negotiation. As well as being a major cost, diesel and electricity are also significant contributors to GHG emissions. So maximising energy efficiency can not only help farmers be more profitable it can also help farming communities be more sustainable. Renewable energy and farming are a winning combination. Wind, solar, and biomass energy can be harvested forever, providing farmers with a long-term source of income. Renewable energy can also help reduce pollution, global warming, and dependence on imported fuels. Farms have long used wind power to pump water and generate electricity. Some large organisations have installed large wind turbines on farms to provide power to electric companies and consumers. Some farmers have also purchased wind turbines; others are starting to form wind power cooperatives. The amount of energy from the sun that reaches Earth each day is enormous. All the energy stored in Earth's reserves of coal, oil, and natural gas is equal to the energy from only 20 days of sunshine. Most areas of farmland in Australia receive enough sunshine to make solar energy practical. Solar energy can be used in agriculture in a number of ways, saving money, increasing self-reliance, and reducing pollution. Solar energy can cut a farm's electricity and heating bills. Solar water heaters can provide hot water for dairy operations and houses. Photovoltaics (solar electric panels) can power farm operations and remote water pumps, lights, and electric fences. Farm buildings can be renovated to capture natural daylight, instead of using electric lights. The options that make the most sense for farmers depend on local renewable resources, energy markets, and the types of support available from federal and state government. Biomass energy is produced from plants and organic wastes—everything from crops, trees, and crop residues to manure. Crops grown for energy could be produced in large quantities, just as food crops are. Crops and biomass wastes can be converted to energy on the farm or sold to energy companies that produce fuel for cars and tractors and heat and power for homes and businesses. Farm Case Studies and Renewable energy. The Australian textile industry is diverse and has some 680 firms that supply textiles to consumers and other manufacturing sectors. Textile production undergoes many separate processing steps with each step having a potential environmental consequence. One of the many sustainability issues that relate to this large and important industry is textile waste sent to landfill. This issue is a great cost to the industry and the economy. Both the industry and consumers produce textile waste. Sources of Textile Waste in Australia. Approximately 8 to 10 billion dollars of food is wasted each year in commercial and residential waste. That’s around four million tonnes of food that ends up as landfill. Australians throw out one out of every five shopping bags, which equates to every Australian household throwing out $1,036 worth of groceries each year. Food relief agencies are not able to meet demand. Nearly 90% of agencies reported not having enough food to meet total demand. 6 in 10 agencies require at least 25% more food with almost 3 in 10 agencies requiring double the food. Nearly one million Aussie kids go without breakfast or bed without dinner. Small Steps to Reduce Waste. Save money and our environment. The Conversation - Food waste article search. Find ethical & sustainable food. There are simple choices and changes we can make in our daily lives that will help us live more sustainably. We need to change the way we live to reduce our over-consuming lifestyles. Australians consume more of just about everything, per person, than people in other countries. We consume lots of food, paper, timber, metals, energy, water, plastic, glass – you name it, as a nation we consume a lot of it. One way to measure our environmental impact is through an ecological footprint. On a global scale, Australia is a big-foot. We are our very own Yeti of consumption of natural resources. Over consumption is a significant contributor to global warming and climate change and this consumption is the major cause of Australia’s large footprint. The other cause is our reliance on fossil fuels for everything ranging from the electricity in our homes to the petrol in our cars. Our way of life in Australia is threatening the future of our planet. We all have a part to play, as we all contribute to our ecological footprint and to global warming. This is where we can work together. You have the power to change the way you live and reduce Australia’s ecological footprint. One step at a time. Visit here to find out how you can get involved. Cotton is both a food and a fibre. Half of the weight of all cotton harvested is seed which is predominately made into cotton seed oil for food. Almost all parts of the cotton plant are used in some way including the lint, cottonseed, linters, stalks and seed hulls. You can approach this topic from the perspective of waste in food or fashion focussing on cotton. Waste can occur at all stages of a cotton products lifecycle from practices on farm (e.g. energy use) to processing, to use, care and reuse. Where do you imagine the most waste occurs? Every decision you make as a consumer has a consequence. Take a look at the research below and to help you determine what decisions you can make when purchasing and caring for your garments to reduce waste. You may also be interested in the areas of research and innovation that explore ways to reuse fashion by products and parts of the cotton plant. How can you make decisions that will lower the environmental footprint of your fashion choices? What parts of the cotton plant are used? A pilot study - Cotton Gin Trash to Ethanol. Everyone in Australia deserves access to safe, affordable and nutritious food. In return, everyone in Australia should value their food and the role that physical exercise plays in maintaining a healthy body, mind and lifestyle. Students will investigate and reflect on how they can act to encourage themselves and others to have a healthy lifestyle and value the people behind the food we eat and the clothes we wear. Social and community health is about building resilient individuals and communities. Good health is about understanding the balance between what we put into our bodies and what we do with them; it’s about how we deal with the stresses of everyday life; it’s about how we manage our emotions and interact with others. All aspects of our health are impacted upon by the food we eat, the exercise we undertake and the ways we take care of our mental health. Studies have proven the links between a healthy diet, and efficient and effective brain, physical and psychological functioning. Research has shown an average Australian family of two adults and two children spend about 18% more on current diets than would be required to purchase healthy (recommended) diets. About 58% of the food budget for the current diet is spent on “junk”, including take-away foods (14%), alcohol (12%) and sugary drinks (4%). Around one in four (27.4%) children aged 5-17 years were overweight or obese, similar to 2011-12 (25.7%). Source ABS National Health Study 2014-2015. Less than 7% of Australians follow the Eating a healthy diet guidelines, as recommended by the Australian Dietary Guidelines. The average Australian adult derives at least 35% of their energy intake from “junk” foods and drinks. In 2014-15, nearly one in two (49.8%) adults met the Australian Dietary Guidelines for recommended daily serves of fruit, while 7.0% met the guidelines for serves of vegetables. Only one in twenty (5.1%) adults met both guidelines. Nearly seven in ten children (68.1%) aged 2-18 years met the guidelines for recommended daily serves of fruit, while 5.4% met the guidelines for serves of vegetables. Only one in twenty (5.1%) children met both guidelines. In 2014-15, 55.5% of 18-64 year olds participated in sufficient physical activity in the last week (more than 150 minutes of moderate physical activity or more than 75 minutes of vigorous physical activity, or an equivalent combination of both, including walking). Nearly one in three (29.7%) 18-64 year olds were insufficiently active (less than 150 minutes in the last week) while 14.8% were inactive (no exercise in the last week). what the experts recommend you eat. 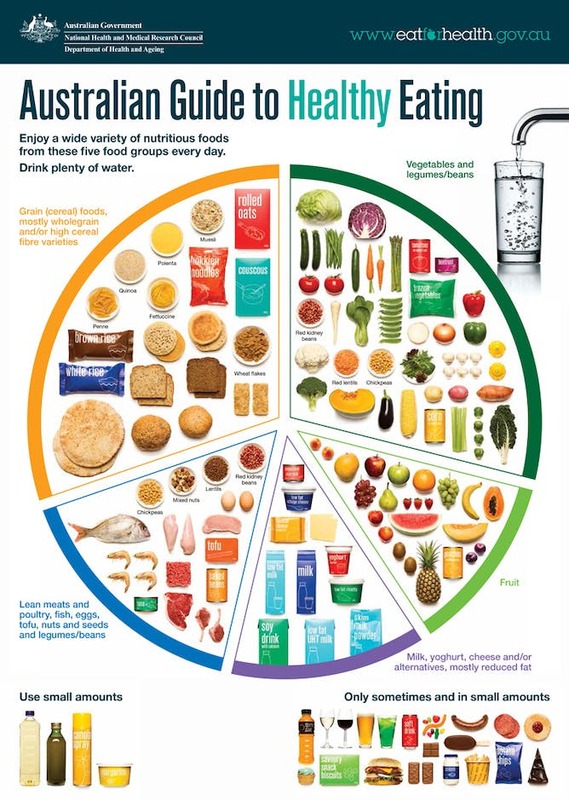 The Australian Guide To Healthy Eating recommends eating a variety of nutritious foods including vegetables, fruit, grain and lean meat to achieve a balanced healthy diet. This guide indicates the need to increase the consumption of cereals, legumes, vegetables and fruit, while consuming meat, fish and dairy products in lesser quantities. Meat is an important source of protein and certain micro-nutrients, including iron, zinc and vitamins and milk is a rich source of protein and calcium. That’s why the Australian Guide recommends two daily serves of milk and dairy products, along with two serves of meat, fish and eggs. Protein intake is important for a balanced diet, as insufficient protein intake can lead to obesity due to excessive carbohydrate and fat intake to meet energy requirements. Plant foods – including grains, fruits, vegetables and legumes – are also vital for keeping us healthy. That’s why the Australian Guide To Healthy Eating recommends a higher consumption of plant foods each day, along the lines of seven serves of cereals, five serves of vegetables and legumes, and two serves of fruit. Doing that can reduce the risk of obesity, diabetes, heart disease and some types of cancer, and increase life expectancy. A healthy and active lifestyle is a lifestyle that contributes positives to physical, mental and social well-being and includes regular exercise. Regular physical activity is an important contributor to good overall health, including promoting healthy weight and reducing chronic disease risk. However, the physical activity levels of many people, both in Australia and around the world, are less than the optimal level recommended to gain a health benefit. The World Health Organization attributes the trend toward physical inactivity to be due in part to insufficient participation in physical activity during leisure time, (recognised globally as participating in less than 30 minutes of moderate intensity physical activity on most days of the week), and to an increase in sedentary behaviour as part of the activities undertaken at work and at home. In 2003, physical inactivity accounted for approximately 6.6% of the disease burden in the Australian population. Source: Begg S, Vos T, Barker B, Stevenson C, Stanley L, Lopez AD, 2007. The burden of disease and injury in Australia 2003. PHE 82. Canberra: AIHW. Only one-third of children, and one in ten young people undertook the recommended 60 minutes of physical activity every day. 60% of Australian adults did less than the recommended 30 minutes of moderate intensity physical activity per day. Fewer than one in three children and young people (5-17 year olds) met the “no more than 2 hours of screen-based entertainment” every day. Nearly 70% of Australian adults (i.e. almost 12 million adults) are either sedentary or have low levels of physical activity. In 2011-12, toddlers and pre-schoolers (aged 2–4 years) spent an average of around 6 hours per day engaged in physical activity. They also spent almost one and a half hours per day (83 minutes) in the sedentary activities of watching TV, DVDs or playing electronic games. On average, children and young people aged 5–17 years spent one and a half hours (91 minutes) per day on physical activity and over two hours a day (136 minutes) in screen-based activity with physical activity decreasing and screen-based activity increasing as age increased. Just under half (44%) of all children and young people (2–17 years) had at least one type of screen-based item (e.g. TV, computer, or game console) in their bedroom. For the 15–17 year olds, three-quarters had some kind of screen-based media in their bedroom and this was associated with them spending an extra two hours per week watching/playing screen-based media compared with those who did not have any such item in their bedroom. The children and young people who participated in the pedometer study, recorded an average of 9,140 steps per day. Children aged 5–8 and 9–11 years were most likely to reach 12,000 steps per day (22% and 24% respectively), while 15–17 year olds were least likely (7%) to reach this number of steps. The highest levels of physical activity were among the young adults with 53% of 18–24 year olds being classed as sufficiently active. Levels of physical activity tended to decline in older ages, with the lowest being among people aged 75 years and over, where the average time spent in physical activity was 20 minutes per day, and just one in four this age were classified as sufficiently active against the guidelines. Relative socioeconomic disadvantage: Adults in the least disadvantaged quintile were 1.5 times more likely to have done sufficient physical activity compared with those in the most disadvantaged quintile. Health status: Adults who described their health as "excellent" were over twice as likely to have done sufficient physical activity compared with people with "poor" self-assessed health. Body mass index (BMI): The underweight/normal weight population were 1.4 times more likely to have done sufficient physical activity compared with the obese population. Smoking status: ex–smokers and people who never smoked were 1.2 times more likely to have done sufficient physical activity compared with current smokers. Sedentary activity occupied an average 39 hours per week for adults, with close to 10 hours of this sitting at work. People employed in more sedentary occupations (such as clerical and administrative work) spent on average 22 hours a week sitting for work. Watching TV was the most prevalent sedentary activity, at nearly 13 hours a week, peaking at over 19 hours per week on average for people aged 75 and over. Using the computer or Internet (for non-work purposes) peaked at almost 9 hours per week for 18–24 year olds. The way we currently produce food around the world contributes up to 20-30% of the world’s greenhouse gas emissions and accounts for 70% of all human water use. But is it possible to eat well and take better care of the Earth at the same time? The Double Pyramid developed by the Barilla Centre for Food and Nutrition in Italy shows the synergies between food that is good for our health and environment. This model consists of two pyramids: one is the traditional food pyramid like the Australian guide, while the other is an upside-down pyramid ranking the environmental impacts of the same foods. In general, foods at the base of the food pyramid are also those with the lowest environmental impact. Cereal grain crops are primary producers and have a lower water and carbon footprint. Legumes such as chickpea and lentil have less than half of the greenhouse emissions of other cereal crops, as they are able to fix nitrogen naturally from the air and do not require any nitrogen fertilisers. Compared with animal products, emissions from vegetables are lower on a per tonne basis. Most emissions associated with vegetable production come from fertiliser use, electricity use and post-harvest refrigeration and transport. Even a modest replacement of energy-intensive animal products with less-energy-intensive grains, fruits and vegetables would be significant at the global scale. Given that fewer than 3% of people in Australia and the UK are vegetarian, it’s unrealistic to suggest a meat-free diet for everyone. It is important to note In Australia and New Zealand, grazing animals are mainly grass-fed rather than grain-fed (more common in the US), which may play an important role in soil carbon sequestration in grasslands, which reduces greenhouse gas emissions. If a healthy and sustainable plant-based diet is better for our health and environment, why is it that consumption of plant foods in many developed countries does not meet recommended levels? In Victoria, for example, fewer than 8% of adults consume the recommended daily intake of five or more serves of vegetables, and fewer than 46% eat the recommended daily intake of two or more serves of fruit. The recent Australian Health Survey found that one in four adults were eating no vegetables on an average day and only 7% were eating the recommended five servings. Our current diets cost more than healthy diets, so factors other than price must be helping drive preference for unhealthy choices. These likely include the abundant availability, accessibility, advertising and promotion of junk foods that exploit people’s vulnerabilities. It’s therefore important not to blame victims for responding as expected to unhealthy food environments. Given the rapidly rising costs to all Australians of our growing waistlines – 25% of us are now obese, one of the highest rates in the world – failing to act is already proving extremely expensive, in both personal and economic terms. It has been suggested that the government can help by promoting a healthier diet by considering educational and policy measures, such as reinstating the healthy-food star rating systems and restricting junk food promotion. Before you let total and utter despair get the best of you – we can all work together to break the vicious cycle of rising obesity and ensure nutrition policy actions tackle barriers to healthy eating. Ways to do this include increasing availability of healthy foods and drinks in schools and hospitals and regulating against “junk” food and drink advertising directed to children. Together, these small steps can help shift the whole population to a healthier diet. These statistics show there is huge room for improvement and opportunities for you as an individual, as a school and as a community to design and deliver idea/s and solutions for action. It’s up to each of us to make healthier choices, for our own sake, as well as for the environment that our children will inherit from us – and that starts with the food we eat today.